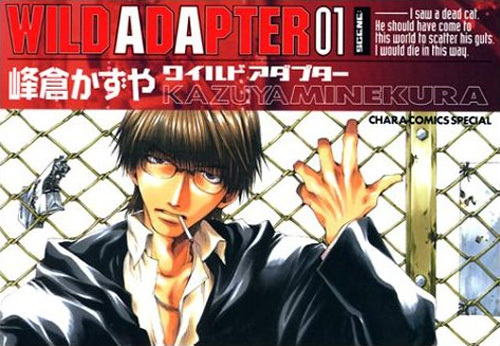 Tokyopop was and is one of my favourite manga publishers when it comes to cover design. They have some strict consistencies in place , such as a band down the side with their company name and the red ovals on the spine to show off the genre and TP logo, but still manage to make each book its own. 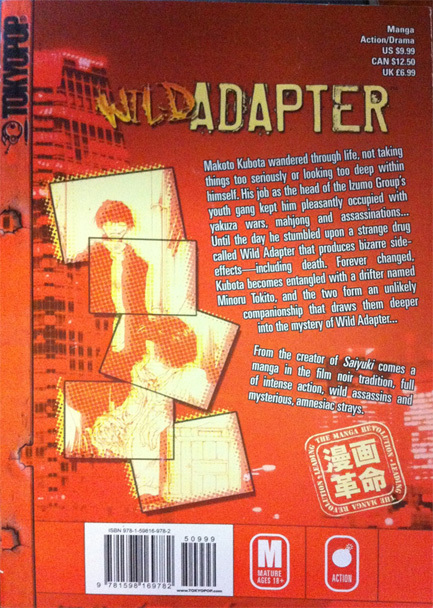 Wild Adapter is a great example of how they took those elements and worked them into the design, allowing it to remain consistent with their other books while still giving Wild Adapter special care. I really like the layout of this cover – the artwork turned like that isn’t something you see often so it really stands out. A complaint I have about the Japanese version though is the area where the title is written – the use of those particular fonts and gridded layout makes it look almost science-fiction like to me. In comparison, I really like what Tokyopop chose to do with that area. The new logo really suits the story – a combination of a feral font for WILD and a grungier looking style for ADAPTER. The background has some rusty looking texturing also. The placement of the author name and volume number is nice too – clear and easy to spot but tidily incorporated in (along with the semi-inconspicuous ‘From the creator of’ notation). It’s too bad that the Tokyopop company line (always on the right spine of the book) cuts off some of the artwork. Still, I love how they carried the design over to it with the bullet-holes and texturing. That you can see the artwork through the holes is a fun little touch too, like you’re seeing Makoto Kubota through a space between metal sheets on a wall. The design on the back of this book is really nice too – I love it when the back of the book isn’t just an after thought for publishers. The text is turned at an angle to match the tilted artwork while still being neatly laid out (I’m a sucker for justified text!). The neat panel work – which are like puzzle pieces for a single important scene in the book – looks snazzy, especially against a cityscape in the background. Even the Tokyopop-standard age warnings and genre sticker (in this case a little picture of a bomb) blend in well with the red on orange – sure it’s coincidence in this case but it looks good all the same. Credit for graphic design of this volume goes to Louis Csontos (as credited in the book) – kudos for the nice work! 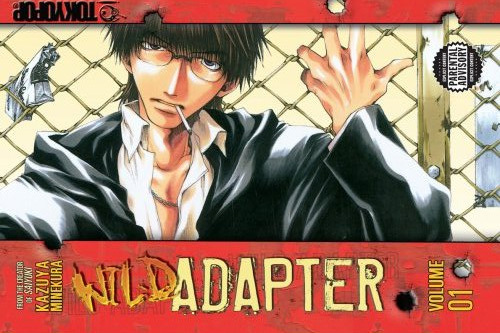 So what do you think of the Wild Adapter covers? Do you think they suit the series well? 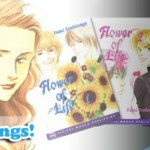 Any preference between the Japanese or English books?